It features a hand selected PNP NOS Germanium transistor. Very warm and gritty. Almost a fuzz, but not quite. An on-board internal bias trimpot lets you dial it in to be a little hotter or cooler if you want. The best feature about the Germanium Treble Boost module is that it utilized the Crown Jewel’s internal negative 9 volt power supply. PNP Germanium transistors prefer to be used in a positive ground circuit, just like the original Rangemaster, the Fuzz Face, the Tonebender, and many of the other very early pedals that used Ge Transistors. They don’t like being forced into negative ground circuits. And if you keep them in a positive ground, they can sometimes not play nice with your other negative ground pedals. You could use an NPN transistor, but they just don’t sound as good. The BYOC Germanium Treble Boost Module uses the negative 9 volt power supply to trick the PNP transistor into thinking it has a positive ground, when it actually has a negative ground. 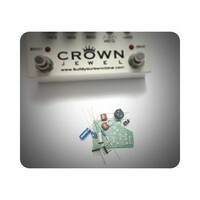 This produces all the tone, less noise, and it will get along with your standard power supply and all your other pedals.